A roots balladeer with a rare personal warmth, Canada’s Scott Cook has managed to distill the stories collected over a decade of near-incessant touring across Canada, the USA, Europe, Asia, and Australia into straight-talking, keenly observant verse. Road-worn, painfully honest, and deeply human, his tunes weave threads of folk, roots, blues, soul and country over spacious fingerstyle guitar and clawhammer banjo arrangements. His fourth release, One More Time Around, was nominated for a Canadian Folk Music Award, and its opening track “Pass It Along” won the Folk and Acoustic category in the 2013 UK Songwriting Contest, with UK magazine Maverick Country naming him “one of Canada’s most inspiring and imaginative storytellers”. 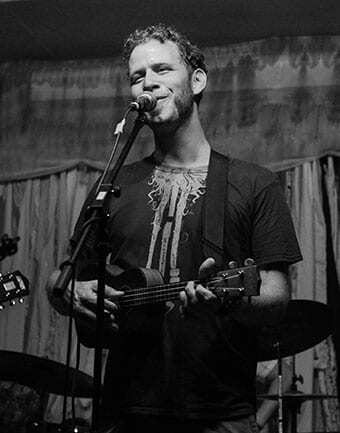 He’s currently touring around the world in support of his fifth album, Scott Cook and the Long Weekends Go Long. Cook is one of the hardest-working DIY troubadours on the road today, averaging over 160 gigs and a dozen festivals a year. All the hard miles notwithstanding, he still believes that songs can change your life, and your life can change the world.